That lifestyle means big business. The most recent Department of Agriculture census from 2012 counted about 800,000 American farms run by people who had a primary occupation other than farming. These recreational farms made up 38% of all farms in the United States at the time. “One of the things that retailers that are struggling with today lack is the level of trust between the retailer and the consumer,” Tractor Supply CEO Greg Sandfort said in 2017. To avoid that pitfall, Tractor Supply emphasizes customer service. The average store only draws around 270 customers a day, so the pressure is magnified on its red-vested staff to convert shopper visits into sales. 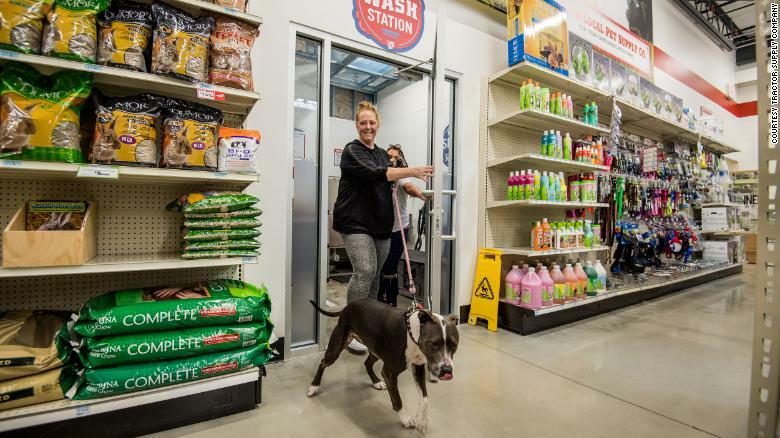 Many shoppers go to Tractor Supply stores to consult with employees on repairs, big projects, and how to care for their animals. Amazon and online competitors can’t convincingly offer the same services, said Scot Ciccarelli, analyst at RBC Capital Markets. Tractor Supply hires workers with farming and ranching backgrounds. It says in its securities filings that it wants to bring on welders and horse owners. “We hire our customers. That is who the team members are in our stores,” Sandfort said last year. Tractor Supply has sharpened its focus on providing expertise by actively posting vidoes and tipsheets online about raising chickens, how to groom horses, and how to fence goats. The company stands out from big rivals like Walmart (WMT), Costco (COST), Amazon (AMZN), Home Depot (HD), Lowe’s (LOW), Petco and PetSmart by positioning itself as the “authority” for its DIY shoppers. Despite its name, the company doesn’t sell tractors at its 15,000 square-foot small-box stores— roughly one-sixth the size of a Home Depot or Walmart. But it does carry just about all of the stuff its customers need to keep up their farms, ranches, barns, and homes and look after pets and livestock. It aims to be a “trip consolidator,” saving customers a separate visit to the hardware, pet, auto parts, or gardening store. Dyer said Tractor Supply is the only place to get quality fencing that will keep his goats ensconced: “They’re escape artists,” he said. “I don’t do a lot of shopping online,” Dyer added. “A lot of times, it’s an emergency, so I need to be able to get it right then— that second.” The company carries around 18,000 items at stores. It has an outdoor section at the front for straw and hay, and bulkier items like cattle gates and dog kennels. Around 75% of Tractor Supply’s customers own pets. Livestock feed and pet food are the company’s biggest business. It offers horse and bird feed. Sprinklers, gardening tools and chainsaws. Tractor beds and garage storage. Snow blowers, lawn mowers, and storage tanks. Overalls, mud boots, and heavy-duty welding shirts. And mini John Deere toys. Pet food and animal feed are Tractor Supply’s biggest and most important business because they drive repeat trips to stores. The company also owns Petsense, a pet food store with 180 locations. 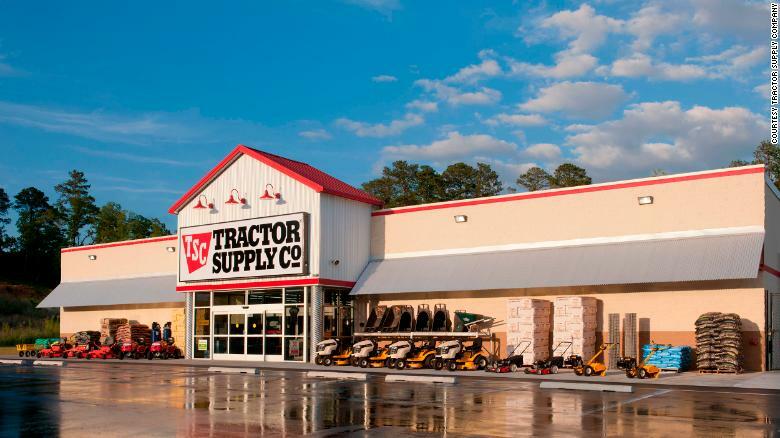 Like most retailers, Tractor Supply is under pressure from the growth of online shopping. “Amazon is a long term risk,” said Ciccarelli. He believes Amazon could eventually siphon off Tractor Supply customers who have to hop in their truck and drive up to 40 minutes to a store. But Tractor Supply says it has woken up to Amazon challenge. The company has raced to improve its website and tech capabilities, especially to attract customers buying off their cell phones, since many in rural areas don’t have broadband. Tractor Supply has added more than 100,000 items to its website, and buy-online-pickup-in-store options. Around 75% of Tractor Supply’s online orders are picked up in stores. The company also believes its new loyalty program, Neighbor’s Club, which has nearly 10 million members, will help it tailor promotions more effectively. “We’re getting data now on our customers that we never had previously,” Barbarick said.